The 5.45x39mm cartridge was a follow-on design to the original 7.62x39mm M43 and M67 that embraced the lightweight bullet concept. 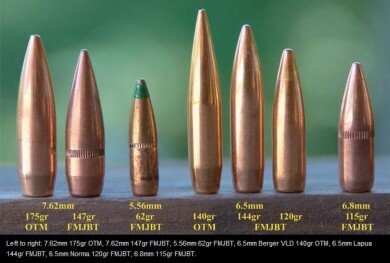 The bullet construction features a lot of steel, making this relatively high-aspect-ratio projectile lose velocity (and thus damage) faster than both the 7.62x39mm and the 5.56x45mm projectile (the 7N6 seems to be about 20-25% less dense than the M193 lead 5.56mm bullet). The cartridge itself propels a 53gr projectile with a steel core and copper-washed steel jacket. Martin Fackler, my favorite ballistician, performed tests that showed that the bullet, on striking flesh, will tumble roughly twice in 45cm of gelatin, but due to the steel construction, is unlikely to tumble and fragment. This would tend to indicate that it might have a pi- damage rating, but it’s high length sideways pushes that up to pi. Basic inputs for the calculator are as follows, selecting 415mm for the (test) barrel length. The Pact-standard M43 steel-core FMJ round was selected as the basic package. This is the classic “adversary” round for modern action and any sort of late cold war game. This replaced the 7.62x39mm in many uses in Russia and the Soviet Union. The recoil impulse of this round is very, very light – perhaps 2/3 to half of even it’s cousin the 5.56x45mm, and the energetics show it: only 1328J from a standard 415mm barrel, compared to about 1760J for the NATO counterpart. The bullet is supposed to penetrate armor better than the 5.56x45mm, but the stats don’t show it. This would be based on the steel construction of the bullet rather than the energetics of the system, which give it a 1-2 point disadvantage in raw penetration relative to the 5.56mm. The velocity is at the muzzle. The velocity with a 415 test barrel is tuned to match real-world data from the 7N6at 1328J muzzle energy, the standard military load issued in bulk. The bullet will only do pi- damage at barrel lengths shorter than 137mm. From there, the velocity chosen for the drop to pi- is 600m/s, which is somewhat arbitrary. The typical barrel lengths for this rifle are in the 8-10″ range for very short rifles (230mm barrel would be 4d pi to 120yds), a carbine at 314mm (4d+1 pi; 180yds pi- range), and a “full length” barrel of 415mm (4d+2 pi; 225yd pi- range). There are a few militarily important variants. The 7N6M has a hardened steel core for enhanced penetration – the core is hardened to Rc 60, in fact, which is respectable for even sword steel (higher Rc numbers in the 61-64 range are common for the edges of hardened sword steel in the japanese katana, for example). It will penetrate 6Zh85T body armor at 80m. The 7N10 increases the weight to 55.6gr, maintains the velocity at 880m/s, and improves penetration such that it will defeat the same body armor out to 200m. 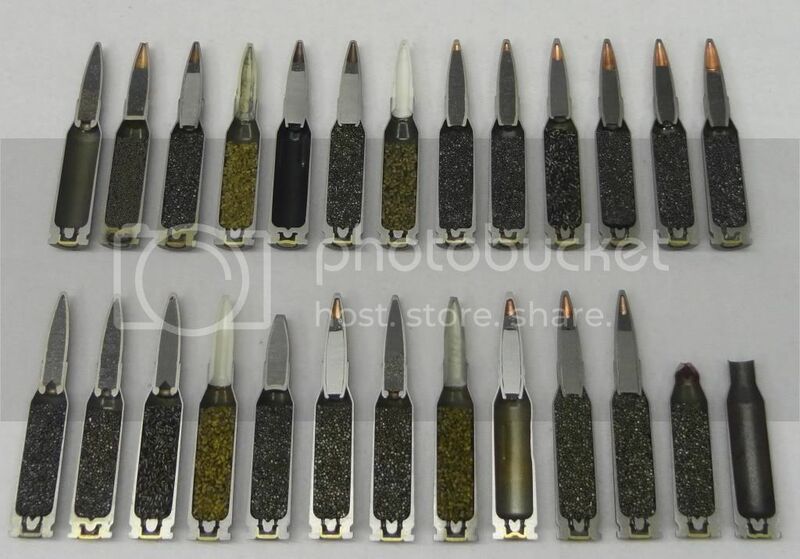 Two dedicated AP bullets, the 7N22 AP and 7N24 “super” AP were produced. The 7N22 is 57gr at 890m/s (5d pi raw damage, probably something like a 1.25 armor divisor) while the 64gr 7N24 has a true tungsten carbide penetrator and the same energy, but will hit for 5d (2) pi- if it doesn’t tumble, and 5d (2) pi if it does. There’s also a subsonic version, 7U1, which is 80gr at 303m/s for about 2d pi-. Better hit something important. The original 5.45x39mm weapon is mostly indistinguishable from the AK-47, and due to the year of introduction, it’s called the AK-74. Plastic magazines, an indentation in the wooden stock, and slight differences in the gas tube are about it. A more recent version of this chambering is the AK-105, with a 314mm barrel instead of the usual 415mm one for the AK-74. The smaller barrel reduces the velocity of the round. The Vepr was to be a bullpup version of the AK-74 for Ukraine, but wasn’t ever really seriously deployed. 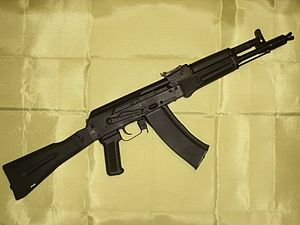 One interesting variant is the AN-94, made from 1994-2006. It’s claim to fame was the super-fast cyclic rate of a two-round controlled burst. It also, to quote from wikipedia, features in the design that the barrel, gas tube, receiver, and bolt carrier all exist as a single component group moving back and forth along an axis parallel to the bore, suspended within what the Russian manufacturers call an Effect-Envelope—the external composite fibre/polymer stock. This configuration separates the events inside the rifle from what the person operating the weapon actually experiences (i.e. low recoil). The SSG 82 was a bolt-action rifle with a 600mm barrel chambered for the 5.45x39mm cartridge. As issued the AK-74 has the big muzzle brake to distinguish it from an AKM which should have a slant "brake". I went for years thinking the AK-74 was just an instance of an inattentive typist transposing numbers. Aw, today was a good day. I have been searching for that one for years. Googling reciprocating barrel AK wasn't giving me what I wanted. Though, did you intend to type 7.62×39, and 7.62 in the INPUT section?